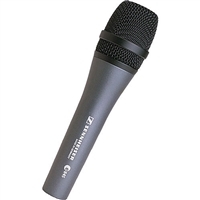 The E 845 is a high output performance microphone, offering power, clarity and projection. Full metal construction and extensive suspension and shock-mounting minimize handling noise and signal interference. High output performance microphone, offering power, clarity and projection.